Uniquely situated on a hilltop overlooking one of Charlottesville's oldest and most characterful neighborhoods, the Woolen Mills Retreat invites visitors to revel in the best of modern Charlottesville living. This striking contemporary home is conveniently located only a short distance from both the cultural hub of the Downtown Mall and tranquil nature trails along the Rivanna River. In addition to thoughtful integration of its indoor and outdoor spaces, the complex has been designed with luxury and elegant simplicity in mind. Visitors enter the grounds from a private gate, arriving to have their first full glimpse of the home, its open courtyard/deck, and the stunning 75 foot long saltwater pool. Perfect both for entertaining and exclusive retreats, you will love imagining how best to inhabit this beautiful space during your stay. Inside, an open chef's kitchen flows outward to a light-filled dining area and onwards to a deep living room, featuring gorgeous walnut woodwork. Also on the main floor is a bright bedroom with two twin beds and a full bathroom. Up the stairs, you will find two more bedrooms, one with a king-sized bed and another with a queen; from the latter, you may step out onto a broad terrace with expansive views in all directions. Be sure to enjoy an evening soaking in the massive concrete tub in the home's master bathroom. Set on a hill, yet having a very private feel, your stay at the Woolen Mills Retreat will delight and inspire. This specific property includes exclusive access to Common House during your stay. Common House is a local membership based social club that offers a unique space to work, dine, and engage. There is a co-work space available during weekdays, a full service restaurant offering breakfast, lunch, and dinner, as well as a roof-top terrace with sweeping views of Charlottesville. Simply show the concierge confirmation of your Stay Charlottesville reservation for access. Kate was amazing! It was an extremely last minute booking. She replied to my inquiry via email within minutes. Followed up with multiple phone calls and went out of her way to make our stay possible. She was pleasant, professional and all around great to deal with. The park at the end of the street was a pleasant surprise! It made for a beautiful walk. Loved the home's exterior lights as well. The design was modern and tranquil! The hardwood flooring was exceptional in beauty. The house felt like a private art meuseum and had so much fun looking at all the house had to offer with an international flair but felt like home. As for the pool, I only wish it was a tad warmer during our time so we could have enjoyed the serine surroundings more! beyond a confirmation email, there was no further communication. i trust when things run smoothly, there is no need. ever since my daughter moved to Charlottesville two years ago, this home had been on my radar screen as a place to rent during one of our visits. i recently had the opportunity to finally stay here (during previous attempts, it was already booked) and i was not disappointed. it is a super cool modern home with many thoughtful details incorporated into its design. large windows fill the house with ample natural light. distant mountain views can be had from the 2nd floor bedrooms and very large deck - accessible via one of the bedrooms. the large cement soaking tub in the master bath is a pure treat, albeit challenging when trying to "shower" in it. no worries, there is a glorious shower in the downstairs bath so you are covered. it should be noted, this is a modern, but not "new" house. it is beginning to show signs of aging, but is doing so gracefully. this is clearly a home that is lived in, not purely a rental property. the furnishings, bedding, and personal artwork featured throughout the house speak of an owner with a creative eye. my only regret is that the pool was closed during our stay (early october) which was not surprising. i will have to rent this place again in season next time. the woolen mills neighborhood has an eclectic mix of homes - many modest dwellings with other cool modern structures sprinkled in. it is fun to walk around and see the varying styles side by side. there is a nice park just down the street with a trail that runs along the river - great for running. it is very easy to get to downtown from here. beyond the occasional train running directly behind the property (which i found mesmerizing to be honest), the area is very quiet and certainly felt safe. Stay Charlottesville, who manages this property, kept the place more than well stocked with plenty of towels & toiletries in the bathrooms. the kitchen was highly functional with everything you would need. the house was clean upon arrival (the only detail overlooked were old coffee grinds left in the coffee maker). thank you (owner) for sharing your groovy digs with us and thank you Stay Charlottesville for your level of service in maintaining this property. as long as our daughter lives in C-ville, we will return, hopefully for another stay in this fine home. Helpful and coordinated, as always. 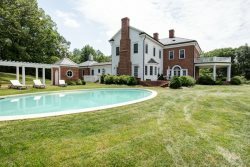 This property is one of the best StayCharlottesville has to offer. The size of the house is perfect for a relaxed weekend away with couples (many of whom have kids and need a break from the action). The pool is clean and refreshing. I'd absolutely rent it again. Great website and great trip. We had a great time. The house has many outdoor features (though we weren't able to use them due to the cold during our visit. The house is right in town, but still in a quiet neighborhood. The price point felt about right for the house. The staff of Stay Charlottesville was very kind, helpful and competent. The modern house was very nice and not far away from the historic district. It was very near the river and the park nearby. The staff at Stay Charlottesville was incredible from start to finish. Awesome at checking messages and returning calls promptly. Staff went above and beyond to make it a great trip for us -- so helpful with early check-in, helping us rent pool towels at the last minute, getting our food that we had delivered into the fridge promptly, etc. We loved everything about the property. The beds (and bedding) were super comfortable. Nice room darkening shades in the bedroom. Comfortable layout of the house. Beautiful, clean pool and nice yard. Would stay there again in a heartbeat. We enjoyed staying at the house very much and especially enjoyed the pool. It was very private and easy to get to for guests. Everyone was great. Never a problem! From the moment we walked into the Woolen Mills home we felt at home! Everything here is comfortable and the space was large, yet still felt cozy. We used the home for our long wedding weekend and it was perfect for our needs! We even stayed one extra day alone after the celebrations were over, watching football in the living room and lounging all day. There isn't a thing we would change! Thank you! The Stay Charlottesville team is great and very responsive. The house is beautiful and in a pretty convenient location.The pool and roof deck are wonderful features of the home. The home was overall very nice, however, there are places where the paint needs to be touched up, and the kitchen could use a good scrubbing. Otherwise, our stay was perfectly pleasant and everyone loved the house. Your team was great--my first night, before the rest of my family arrived, the power went out. Your "on call" person responded right away, and when I returned from dinner out with my son, the power was back on. The house is beautifully designed, with very interesting photography everywhere, and a modern but very comfortable aesthetic. We loved the pool and used it everyday. Very comfortable for three couples, including my eighty year old parents. We hosted a family dinner party after my son's graduation and the kitchen had everything we needed. The house and pool feel very private and peaceful, even though you are surrounded by other homes. We would definitely stay here again! The email instructions were very clear and complete and the house was spotless. We really enjoyed staying there and couldn't be happier with our rental experience. The Woolen Mills Retreat is a stunning, modern home that seems a bit out of place in the neighborhood. We had the groom's side of our wedding stay there. We tossed the football and Frisbee around on the lawn, swam in the beautiful lap pool, and grilled burgers outside during the day. At night we played music indoors and watched playoff basketball in the comfy living room. The deck upstairs was quite nice, too. Everyone loved staying there. We'll be sure to rent it again on our next trip to C'ville. Your home is a dream and it served as a wonderful backdrop to Henley's wedding get-away weekend! Stay Charlottesville was great! Your home is lovely. Everyone enjoyed themselves so much and thought the house was beautiful. Thank you so much- we will come back!